Jerry Rao ambassador of School Choice Campaign: Fund Students, Not Schools! Originally from Bangalore in India, and a graduate of Loyola College in Chennai, Mr Rao studied further at the Indian Institute of Management in Ahmedabad (IIM-A), and the University of Chicago. 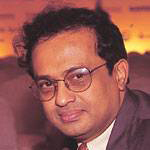 Mr. Rao held several positions in Citibank prior to his founding MphasiS in 1998. In a banking career of over 20 years, he served with Citi and its parent Citicorp in various capacities in Asia, Europe, South America, and North America. He was Head of the Development Division of Citicorp and Chairman and CEO of Transaction Technologies Inc., based in California. Earlier, he was Country Head for Consumer Banking in India, where he was primarily responsible for building one of the bank’s most successful Asian retail and credit card franchises. When he left Citicorp, Mr. Rao was part of Citi’s Operating Review Group – the top 50 managers in the company. In 1998 Mr. Rao started Mphasis Corporation, a software company based in California, which subsequently merged with BFL Software in 2000 to form Mphasis-BFL with twin headquarters in Santa Monica, California, and Bangalore, India. Mr. Rao is actively involved with the Confederation of Indian Industry and with the Government of India’s Software Technology Park initiatives, and has been Chairman of India’s National Association of Software and Service Companies – NASSCOM. MphasiS Vice Chairman Jeroen Tas and Mr. Rao were named the Ernst & Young 'Entrepreneur of the Year 2004' for the New York region, which followed his being similarly awarded in India two years previously. In 2005, the Government of the Indian state of Karnataka honoured him with the prestigious Rajyotsava Award. Mr. Rao is a regular writer and speaker. His many areas of interest include technology strategy, customer relationship management (CRM), financial services, and e-commerce – a subject on which he has testified before the US Congress. A published poet, he is reportedly working on a second book of poems and a historical novel set in the 16th Century. He writes a regular opinion column for a leading Indian newspaper, the Indian Express, and teaches occasionally at IIM-A as well as for the Sujaya Foundation.